Charles Street, Beacon Hill, Boston | The intersection of history and modern small business. The following article is that help. 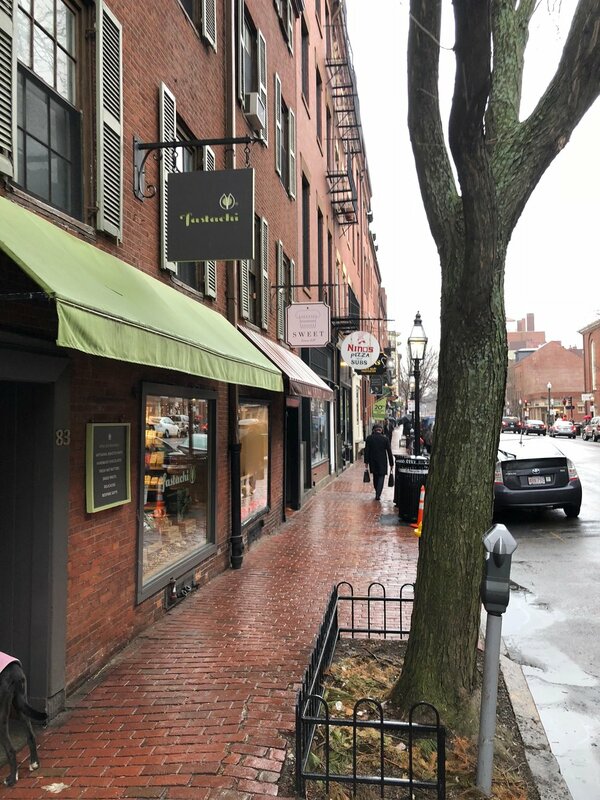 Not from the handful of brick-and-mortar stores in Beacon Hill, Boston, but from business owners running every kind of business throughout the world. If you've ever wondered what Modern da Vinci is all about, it's the private therapy clinics, online fitness stores, government consultants, and other small business owners wearing so many hats. It's about those business owners that are continually learning and always working to make a small change in the world through the customers they support. Read through the experiences of these 11 small business owners below. If only one shared lesson helps you move your business forward, it will be well worth your time. Oh, and you're not the only one out there struggling, facing challenges, and looking for help. So share this article (click the Facebook, Twitter, or other buttons on the left of this page) and help your fellow business owners grow with purpose and speed. We offer Affordable clothing for women of all sizes. The biggest challenges my business has faced has been gaining a customer/client base. We are strictly online so for clothing that can be hard. The biggest thing was getting our name/products out as much as possible. We started going to local events and offering in home shopping nights to be able to offer clients the opportunity to try items on. Once we developed a good relationship with individuals it really spread organically. Word of mouth has been huge for me. One thing I do is package every item I mail out in attractive packaging and write a small note thanking them for supporting my Dream and so forth. That has been huge! Everything is so impersonal now people really appreciate the little things. We work with the homeowner to get stuff done. Our biggest challenge so far has just been keeping everyone safe. The home owner especially. Solution is following safety rules and equipment. Be careful. The biggest challenge for my business is finding and retaining good resources. In the past we have struggled to find the right candidate that can help us with our clients and services. We have improved our recruiting process and a good balance to validate and make sure the right resources are part of our team. We make work and learning more fun! I've learned that apparently most small-business owners are like me: We're technicians who love what we do, and we weren't born businesspeople. The reasons I started my business are unrelated to the skills needed to run a business well. So I have to find ways to trick myself into doing the "boring" stuff - managing a sales pipline, managing staff, meeting financial goals, etc. I realized all this about 4 years of running my business fulltime, and this year (5) I'm implementing them! I provide an all-in-one agency solution for small business owners to develop their brand and easily manage their digital marketing – logo to IP targeting. My biggest challenge has always been not giving away the farm. I created my business because I was a struggling small business owner and wanted to help other small businesses get the help they needed to get off the ground. Everyone has the next great product, and I wanted to provide that in one space, one contact, one manager so small business owners could feel safe and not like they were spinning their wheels or wasting money. So I came up with a pricing model for my target demographic that stays within budget for each of us and allows us both to grow strategically. It’s as much marketing as it is business consulting. We help businesses hire better people through the use of pre-hire testing that screens for attitude issues, emotional intelligence, abilities/skills, and personality fit for a job. Our greatest challenge has been in defining our ideal and target audience or client. It seems like any business who hires people could benefit from using pre-employment assessments, right? While that’s probably true, our specific tools are really best suited for businesses in certain industries, who have between 5-500 people, and are hiring for certain roles. Through a lot of trial and error, readjusting our messaging, game planning, and overall pivoting when we needed to, we are slowly doing a better job of focusing in on those clients. Plan4 Healthcare enables hospital executives and managers to plan resources more accurately, manage finances more efficiently, and direct operations more effectively, leading to better long term results and care. We built the company from scratch, starting with no investors, no capital, no staff etc. A major initial challenge was getting through the first years where my partners and I handled every facet of the business spanning operations, sales, delivery, and product development. Now that we've achieved some success, the biggest challenge we face is figuring out how to grow strategically. By that I mean making sound decisions on where to make hires, outsource some functions, and invest while also keeping the company lean and maintaining cash flow. Our fitness business helps busy people look better naked without living in the gym. Our fitness business mentorship helps trainers incorporate online business into their in-person training. When I was 24 I had a fraudulent accountant steal 50k from my business, which added up to a nearly 100k swing and lost revenue after repaying penalties and interest to the IRS. I had to go back to the drawing board, remake my offers, and find out how to scale my business online to make ends meet. I found out how to incorporate product sales and online training into my brick-and-mortar business and doubled my revenue. We help B2B companies drive online leads and sales. Our biggest challenge has been ping ponging between focusing on growth and customer service, often times in the same hour. Typical business start up issues. Hiring coaches has been invaluable, in helping short circuit many learning processes. I create an irresistible connection between a company's products and the problems of the buyers they most want to reach. My biggest challenge was explaining how I help in a way that connected with clients—I was way too vague, and people were reluctant to buy. Once I figured out how to show my lead generation and conversion solution from soup to nuts, then zero in on a potential client's problems within that visual framework, my sales cycle shrunk dramatically and revenue went up. Showing my entire solution gives customers confidence I'm not winging it, and seeing where they are in the flow of the solution primes them to order more services—and get bigger results—down the line. I help children and adults with speech and language disorders achieve their communication goals. My biggest challenge as a small business owner has been finding more time to work on the business and not in it. My solution is to delegate all of the business and other tasks that I don’t need to be involved with through a personal assistant.